Are you stranded on the side of the road? Were you recently in a wreck? The winding rural roads of North Georgia, while beautiful, can pose certain dangers to drivers. Whether its a mechanical problem with your vehicle or you hit a deer or another car, you’re probably frustrated, stressed, annoyed, maybe even angry. Misfortune can happen anywhere, at anytime – in the middle of the night or during rush hour. When it does, Car Crafters is here to make sure you don’t stay stranded for long. We’re always on call – 24 hours a day, 7 days a week. If we could turn back the clock to prevent this from happening to you, we would. What we can do though is provide help quickly and professionally. Our services are affordable, reliable and available 24/7. Peace of mind is only a phone call away! How much will a tow cost? 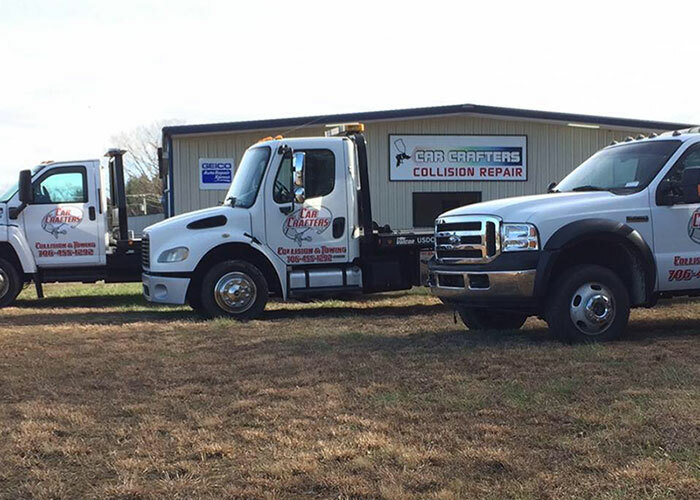 For 20 years, Car Crafters has been North Georgia’s leader in collision repair and towing. We can restore your vehicle after an accident and offer a lifetime guarantee on all repairs. We work with all major insurance companies. From day one, we’ve provided friendly and dependable towing and collision repair service to our community that goes above and beyond. We are fully licensed and insured. Our state-of-the-art fleet of flatbed tow trucks and wreckers is conveniently located just down the road from downtown Blue Ridge on GA-5, so we can get to your location in minutes.